No one knows for sure when Indigenous peoples arrived in North America or where they came from. It is generally assumed that the first humans to come here travelled over a land bridge that existed where the Bering Strait is now (between Russia and Alaska). Some people think this happened as long as 100,000 years ago; others say it was closer to 12,000 years ago. Over the years, these first inhabitants of the western hemisphere migrated across its width and as far south as South America. 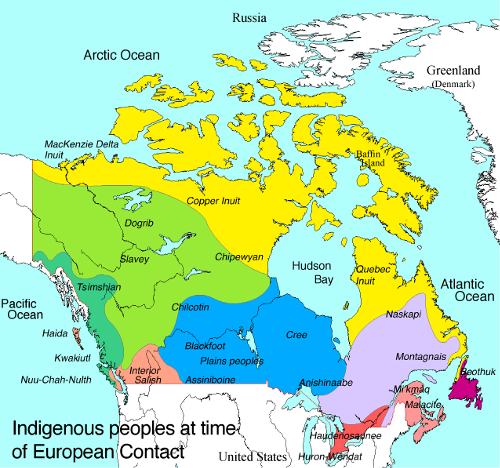 The Indigenous peoples of Canada evolved into distinct groups. By the time the Europeans began to arrive there were a number of different nations from the Beothuk of Newfoundland to the Haida of the west coast and the Inuit of the far north. Often the variations in lifestyle and culture grew out of the different environments in which they had to live. Some had tipis or wigwams covered in bark; others, who lived in less treed areas, used skins or snow blocks for shelter. There were different language groups and different dialects within each language group. All had strong spiritual beliefs and a definite system of social organization. Most were quite nomadic: people who move from place to place in search of food or fresh grazing lands.nomadic, deriving their food from hunting and gathering. Some, like the Huron-Wendat, were agricultural and therefore settled in one place for a longer period of time. European contact brought a lot of drastic and irreversible changes to the indigenous world. The Beothuk became completely extinct: no longer in existence.extinct very early and we know little about them. Others diminished more slowly and their culture and languages have almost been lost. Along with their loss of culture came a loss of pride which combined with some cruel and insensitive treatment by successive white governments to put the remaining Indigenous peoples into a state of poverty and despair. Recently, however, Indigenous self-awareness and assertiveness have begun to revive their various cultures and increase their demands for self-government. As far back as 1993, the Minister of Indian Affairs stated that his goal was to do away with the ministry, long a symbol of white control over indigenous affairs. This still has not happened. Today there are over 1,000,000 Canadians who claim some indigenous ancestry; over 400,000 have official Indian status. Indigenous peoples have traditionally been classified in one of three ways: by language, by nation, or by culture. The cultural groups divide along geographic lines since the environment influenced the way they lived. This map shows the basic cultural/geographic divisions and names some of the groups within them. Indigenous Peoples map high-definition custom colour print suitable for classroom wall display. 71 cm x 71 cm (28 inches x 28 inches). Contact us to order. $179.50 includes taxes and shipping by regular Canada Post.